Another sad death this week -- Norman Whitfield, one of Motown's most brilliant producers and songwriters. His best work was with the Temptations, and I wrote about an earlier hit they did with him, "Can't Get Next To You" from 1969. Whitfield pioneered Motown's "psychedelic soul" era, stripping away the orchestrated slickness and love obsessions of Smokey Robinson and Holland-Dozier-Holland, and taking it right to the street, where race riots, poverty and war could no longer be ignored. "Ball Of Confusion" was a turning point for all involved, as this was Whitfield's first step into raw territory. Whitfield altered his production techniques to suit the new mood, while keeping Motown's in-house session band, the Funk Brothers, raw and heavy. More distortion and certainly more in-your-face. 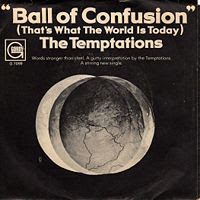 All centered on pretty much one chord, "Ball of Confusion" had a killer bass riff based on a seventh pattern, the kind you know instantly the way you know Led Zeppelin's "Whole Lotta Love." With a clean electric guitar strumming a hard funk riff in time, legendary falsetto Eddie Kendricks grabs you by the collar with the very first two sentences, then Dennis Edwards' tough rasp for the next part of the verse, and you know, this ain't no typical Motown love song. Well, the only person talking about love thy brother is the preacher. And it seems nobody's interested in learning... but the teacher. Ball of confusion. Oh yeah, that's what the world is today. Hey, hey. This was a song of rage and paranoia, of complaint and observation. It was a whole new world, with brothers being shipped off to Vietnam, cities burning down, anger and cries for justice and freedom. Nothing like the Motown for the past several years, when it was "I Second That Emotion" or "Sugar Pie Honey Bunch." The times were changing and Whitman used the Temptations to drag them along into it. Whitfield's production was ingenious. Chugging on that one chord funk groove, the song shifts a few times to what I call "the circus break" -- a united horn section cranking a three note I-IV-V progression, percussion cooking, and a wailing harmonica and then an intense wham with the whole group shouting: Hey oogabooga, can't you hear me talking to you, just a ball of confusion. That's what the world is today... hey, hey!